Plack Blague at The Slowdown, Dec. 30, 2016. The Blague performs at Reverb tonight with ADULT. ADULT. is a Detroit synth-rock act that’s been kicking around since 1998 with a number of self-released recordings (but mostly distributed by Thrill Jockey). They’re playing at Reverb tonight at 8 p.m. Fun fact: ADULT. did a remix of The Faint’s “Agenda Suicide,” see/hear below. Another fun fact, Lincoln electro-leather-geek-punk legend Plack Blague opens, so get there early. $12. 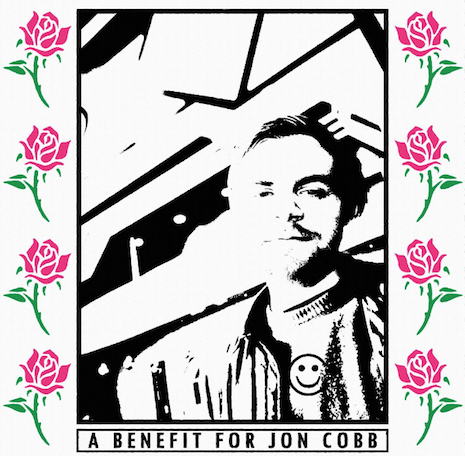 The benefit for Jon Cobb is tonight at The Waiting Room. I’ll admit it right now: I don’t know Jon Cobb. So I reached out to my pal Brad Smith of Almost Music, who told me Mr. Cobb is a member of such notable local punk acts as Bib, Suzi-Q, Dilute and one-man act Ruby Block. “He’s also one of the kindest, sweetest people I know,” Brad said, and let’s face it, we all know Brad is one helluva judge of character. According to the One Percent website, Cobb also works at Reverb and The Waiting Room, so, if like me you don’t know who he is, chances are you’ve still crossed paths with him if you’re a music fan. The reason I’m telling you this is because tonight there’s a benefit for Jon Cobb at The Waiting Room. Cobb has been in and out of the hospital and unable to work. All proceeds from this show will go toward helping pay his personal and medical expenses. The all-star line-up for tonight’s benefit: Crease, Death Cow, Nathan Ma & the Rosettes, Effluvium, Jocko, Cult Play and Plack Blague. The fun starts at 8 p.m., entry is $10. 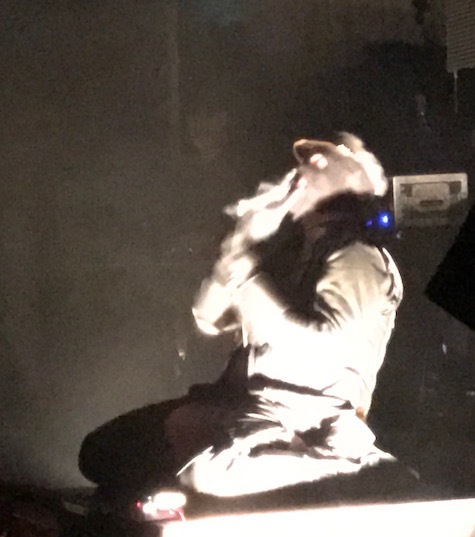 The Faint at The Slowdown, Dec. 30, 2016. I think we’re going to start a new tradition for New Years — instead of celebrating on New Year’s Eve, when the drunks are out, with all the traffic and the unholy fireworks, we’re going to celebrate the new year the night (or the weekend) before NYE. I figure I’m going to be home on NYE at midnight anyway to shield the dogs from the war noises booming overhead, I might as well celebrate the new year before the fact. Kind of like we did this year. Now if only we could get The Faint to play a pre-NYE show every year. The Slowdown was packed Friday night, but not too packed. In the old days, The Faint would have easily sold out two nights in a venue the size of The Slowdown. Now the best the band can do is comfortably fill a large venue two nights in a row. Let’s face it, the band’s heyday was 15 or so years ago with the breakthrough of Danse Macabre, and even back then, I remember seeing The Faint perform that album at Sokol Underground — a show that stands out as my all-time favorite Faint performance. It’s followed closely by an unannounced pre-grand-opening performance at The Waiting Room in 2007 — probably the loudest Faint show I can remember. That same year, in June 2007, The Faint had sold out a two-night residency at Sokol Auditorium. All of those Sokol Aud shows from that decade (and the years that followed) were complete madness — hot sweaty bouncing dancing messes of humanity; absolute spectacles. Last Friday night’s show didn’t quite reach the level of those Sokol shows, but it was a good time nonetheless. If there was a drag on the performance it came from the audience, because the band was clearly on point playing a set of greatest hits in support of their CAPSULE: 1999-2016 album that just came out on Saddle Creek. It’s easy to forget how many great songs these guys have recorded. It’s a good time to mention that the new material — three new songs released as part of the CAPSULE album — stand tall among their finest efforts, seamlessly blending into the set. 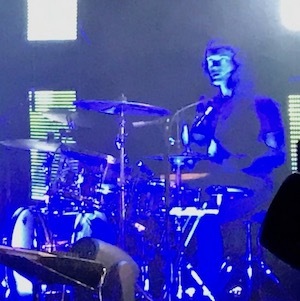 A ghostly Clark Baechle behind The Faint’s drum kit…. 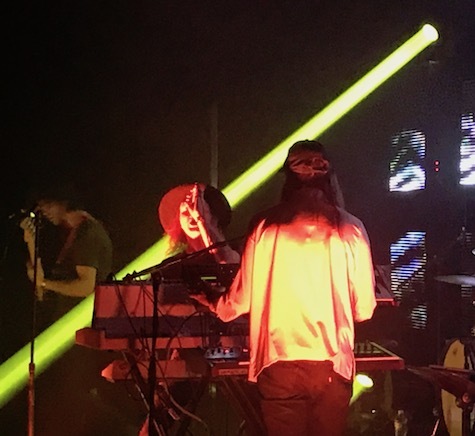 The Faint’s light show has been an evolution over the years. I remember the days where they controlled colored floodlights with floor pedals, to haunting effect. These days the light show is a flashing, strobing choreographed wonder in perfect sync with every bone-rattling beat. I have no idea how it could get any better. Maybe it was thos awe-inspiring lights or the enormity of the music but the audience on the floor seemed a bit dumbfounded. It took half a set to get their butts moving and not until the end until they got their arms in the air and bodies began to be carried over the crowd — a far cry from those old Sokol Aud days. The band kicked off the four-song encore with a rehearsal of sorts for a surprise they intended to roll out the next evening, NYE — a cover of Prince’s “1999” — a sloppy, rowdy, slam-bam version wherein the band got lost somewhere after the second verse, which the crowd either didn’t notice or didn’t care. The whole place blew up for the last song of the encore — a celebratory version of “Glass Danse” that left them covered in sweat. There is no such thing as a bad Faint show. Plack Blague at The Slowdown, Dec. 30, 2016. 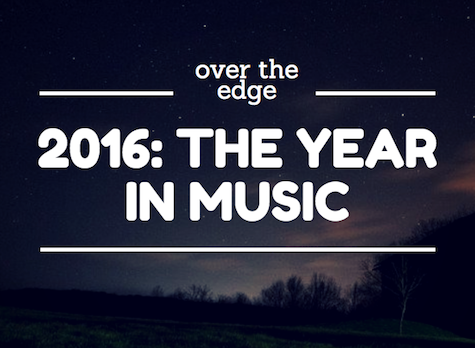 It wouldn’t be a new year without looking back on the old year, and as such my 2016: The Year in Music story finally went online at The Reader‘s website. The article includes a look back at a rather rough year, a year that will be remembered more for its deaths than its music. We lost a lot of heroes in 2016, and the wounds are still very much open for a lot of us. The article also includes my list of favorite albums as well as my favorite live shows from 2016, along with a crapload of photos. Take a look. 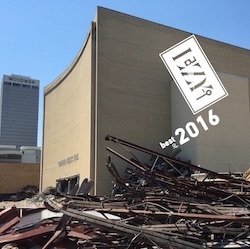 And while you’re remember 2016, you might as ell ahead and enter the drawing for a copy of Lazy-i Best of 2016 Comp CD. 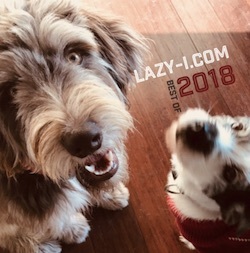 The collection includes my favorite indie tunes I’ve come across throughout last year as part of my tireless work as a music critic for Lazy-i. Among those represented: The Faint, Oh Pep!, Mitski, Quilt, Low, Big Thief, Father John Misty and lots more. The full track listing is here, or take a listen if you have Spotify. Entering to win a CD copy is super simple: 1. Send an email with your mailing address to tim.mcmahan@gmail.com, or 2) Write a comment on one of my Lazy-i related posts in Facebook, or 3) Retweet a Lazy-i tweet. You also can enter by sending me a direct message in Facebook or Twitter. Hurry, contest deadline is midnight Jan. 9. A frightening still from Plack Blague’s 2014 video for “Boyz Club.” The Blague plays tonight at O’Leaver’s with Digital Leather. They’re calling it “The Leather Invasion.” Tonight Digital Leather returns to fabulous O’Leaver’s. On the heels of this week’s album announcement (and a brief tour that brought them to Austin), you can probably expect these guys to be playing new material from the forthcoming FDH release All Faded, out June 23. DL is opening (or so it seems) for the infamous Plack Blague, who must be seen and heard to be believed. $5, 9:30 p.m.
Also Friday night Simon Joyner opens for Denver singer/songwriter Esme Patterson at the Reverb Lounge. Patterson, who also is a member of Denver band Paper Bird, is touring in support of her new album, Woman to Woman (Greater Than), of which The New York Times said: “Her voice is wiry and candid, backed by arrangements that roll along the folk-country borderline.” Also on the bill is Sean Pratt and the Sweats. $10, 9 p.m.
And don’t forget that Big Al’s Free Music Festival continues tonight and tomorrow night at The Hideout, 320 So. 72nd St. Admission is a can of food (it’s a food drive) and it starts at 8 p.m. Details and Friday and Saturday’s schedule are here. Saturday night it’s back to O’Leaver’s for Derby Birds with Roxi Copland. $5, 9:30 p.m.